Today Google released some very high resolution (3 inches/pixel) imagery for a part of Las Vegas. 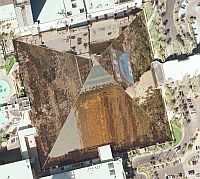 You can see an example here of the Luxor Hotel (a pyramid with mirrored windows). If you visit the Luxor Hotel in Google Earth, and lower yourself (or zoom) to see in detail, you can easily read advertisements on the side of the building, see cars reflected in the windows, and if you look around the area you can not only make out car types, but can even see people (and their shadows). An airport is also captured in the high resolution section, and you can easily make out plane types and see the support equipment around the airport. You can see the Paris Hotel's Eiffel Tower replica in great detail as well. An awesome area to explore. Here's the announcement from Google. According to the post, the Las Vegas imagery was taken very recently (March, 2006). In addition, they put back some islands around Thailand which were accidentally removed in the 23-March update. Google didn't give any reason for why they released this new high res imagery for Las Vegas. Maybe they are taking a gamble? Read about the bigger data update made 23-March-2006. Check out the new real-time Global Cloud Map overlayed onto Google Earth making it look like the real Earth from space. Also, you may find the story about the world's largest Apple iPod ad interesting. Great Res. I see the Stratosphere Tower is now missing. You can still see it in Google Maps though. I think I might have found out why this update has come online. Open your temporary places and double-click. I can see the high resolution around Las Vegas. I cannot see the top of the Luxor hotel as in the above picture. I restarted my computer and restarted gearth, but still cannot see anything. Anyone else having this problem? Not too recent, as I was there in February and the Wynn was open. In the above linked shot, it's not even built yet. Robert, your tinyurl link is showing imagery in Google Maps. The new high resolution imagery mentioned in the article is ONLY in Google Earth. Any thoughts on why the stratosphere was removed? I was hoping to make out the frightened faces on the roller coaster. are these sat pics or photos from plane? The reason is because of the AP story from 2 days ago talking about how great the imagery used by windows live local is. I'm sure it is, anyway. Hey, The reason may be because they want some "before" shots before the gov't sets off the mushroom cloud over LV. if you don't know what i'm talking about, it's a just a test explosion, that i read on digg, i forget the link though, sorry. So, the stratosphere is missing...BUT you can see its shadow on the ground north of where it should be. That is very bizzare! "Hey, The reason may be because they want some "before" shots before the gov't sets off the mushroom cloud over LV. if you don't know what i'm talking about, it's a just a test explosion, that i read on digg, i forget the link though, sorry." I read that article too... wonder if Google thinks the government is going to fudge their text explosion up and take out parts of vegas??? Would be useful for insurance purposes if that did happen and then google could get back at the government for invading their servers!! The missing Stratosphere was probably taken by the same aliens who stole the planes leaving the Dallas Airport and left their shadows behind on Grapevine Lake. Strange that the Paris Balloon is missing as well, some wierd dinosaur looking thing in its place!